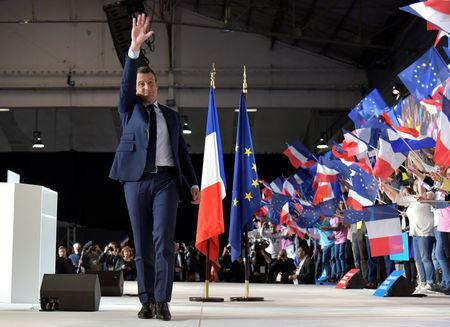 MARSEILLE/BIGUGLIA, France (Reuters) - France's centrist presidential contender Emmanuel Macron singled out the far-right National Front as his chief rival on Saturday, vowing to win the first round on April 23 as a new poll showed the election race getting tighter. "The National Front, our main opponent, is attacking us on all sides. Never boo them. Fight them," a defiant Macron told a rally in the southern city of Marseille. "I want us to kick far from this campaign and from the country the party of hatred and contempt and all those who make us so ashamed. We are going to be ahead in the first round and we're going to beat them," he said. The presidential race is even closer than it was a week ago, an opinion poll indicated on Saturday. First-round voting intentions for the frontrunners, Macron and National Front leader Marine Le Pen, showed both slipping one percentage point to 25 percent and 24 percent respectively. Third-placed conservative Francois Fillon gained two points to 19 percent, while the far left's Jean-Luc Melenchon climbed one point to 15 percent, according to the survey by the BVA polling institute conducted on March 29-30. Complicating predictions, 38 percent of people either could not say how they would vote, or may yet change their minds. That was down two percentage points from a week earlier, but showed the race remains wide open. The poll showed independent Macron had solidified his voter base, with 63 percent of those opting for him sure of their decision, up 8 points from a week ago and his highest certainty score since campaigning began in earnest in February. However, Le Pen still had by far the most solid voter base, with an unchanged 81 percent of her voters certain to pick her. 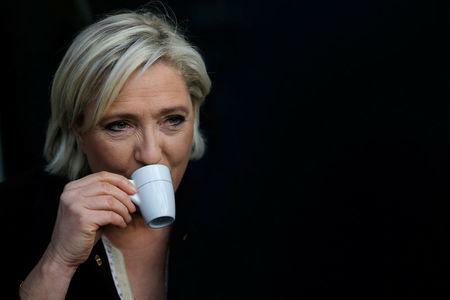 Shock election outcomes abroad including the U.S. presidential victory of Donald Trump and Britain's Brexit referendum vote have fed expectations that Le Pen's anti-euro, anti-immigration platform could sweep her to power in France. The poll though, like others this year, showed Macron beating her with 60 percent of votes in the May 7 second round. Fillon's recovery from the lows that followed a fake work scandal surrounding his wife puts him within 5 points of Le Pen and 6 points of Macron, with some voters previously tempted to abstain deciding to go for him after all, BVA's commentary said. BVA put Melenchon's climb since a strong performance in the first TV debate on March 20 partly down to more of his natural sympathizers deciding to vote. It said official Socialist candidate Benoit Hamon, who is in fifth place on 11.5 percent and also has hard left policies, could be vulnerable. Le Pen was due to hold a meeting in Bordeaux on Sunday, but it was her two main rivals who made headlines on Saturday. 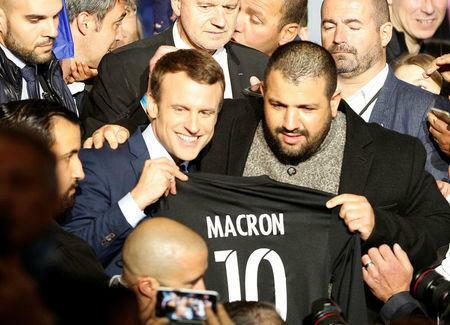 During his visit to Marseille, Macron met conservative and security hardliner Christian Estrosi, part of his strategy to show he wants to transcend the right-left divide. Estrosi is a key ally of conservative former President Nicolas Sarkozy. He stands a long way to the right of the Socialist government in which Macron was economy minister until last year, but was among those who tried and failed to oust scandal-hit Fillon as the candidate of The Republicans. Fillon sought to get his campaign back on track by turning back the clock with a warning about France's heavy debts. France faces the same fate as Greece, he said during a visit to Corsica, reviving a controversy he stoked on the Mediterranean island in 2007 when -- during his term as prime minister under Sarkozy -- he said he was head of a "failing state." Fillon has based his campaign on the need to rein in spending and cut France's deficit, pledging 100 billion euros ($106.5 billion) of spending cuts and a reduction of 500,000 public sector jobs, proposals that are tougher than those of any other mainstream candidate.